April 9th, 2018 — At the North Kaibab Trailhead of the North Rim of the Grand Canyon in Arizona, my Garmin Fenix 3 provides two disconcerting pieces of information; first is its low battery warning, which at 8 hours and 53 minutes into what will be a 19 hour run, isn’t good, second, the watch’s GPS says I’ve run 44.54 kilometers before starting my return run to the Grand Canyon’s South Rim. That’s high! My research estimated half-way at 38.25k, for 76.5 kilometers total. The difference between 89 kilometers and 76.5 may seem a trivial 12.5 kilometers, but the furthest I’ve ever run before is 55. That’s a big jump of distance. Another wrinkle, I only packed “nutrition” for 76.5km, and this is the Grand Canyon – it has a bit of a reputation, as does running Rim to Rim to Rim. Rim to Rim to Rim generally sees runners (and hikers) begining at the South Rim, descending the Bright Angel Trail or South Kaibab, crossing the Colorado River (don’t worry, there’s a bridge), then ascending the North Kaibab Trail, before turning around and doing entire adventure in reverse. The shortest Rim to Rim to Rim (or R2R2R as it’s known) route features about 6529 metres (21,400 feet) of elevation change over 67.6 kilometers (42 miles). 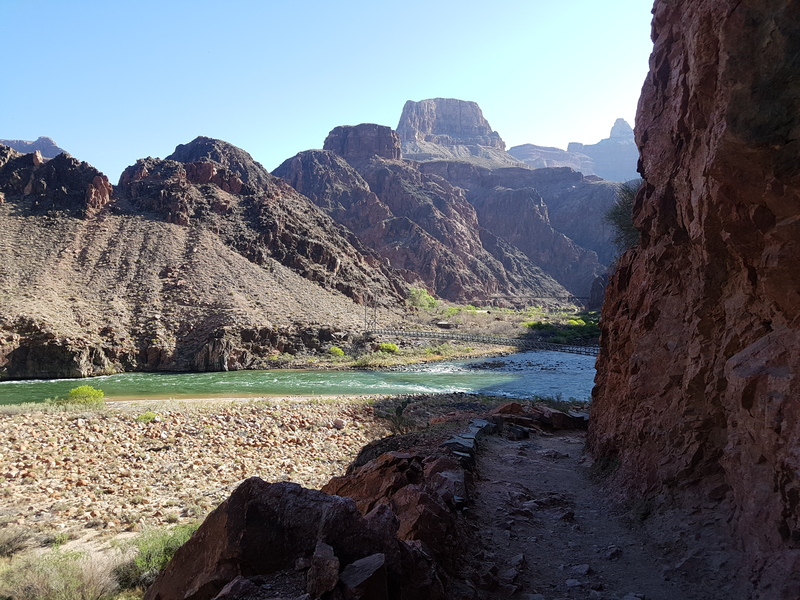 I’ve taken the longer route, descending Bright Angel Trail, rather than the steeper South Kaibab Trail, crossing the Colorado, then ascending the North Kaibab, which at minimum is 76.5 kilometers (47.5 miles) in distance. It’s a beast of a run, then there’s the canyon itself. It isn’t that the Grand Canyon is trying to kill you. It’s just 2 billion years of geological history set in an environment that is utterly indifferent to the puny human scale of your mortal coil. Slip and the drops will kill you. Run at the wrong time of year and the heat will kill you, or the lack of water will kill you, or the cold will kill you. Tempratures between the Rims and the canyon floor can vary by as much as 16C, before factoring natural the build to the day’s peak heat. A lack of preparedness will kill you… Right now a lack of calories, the distances, and some unexpected bonus kilometers, are queing up to take a stab at me. Back around 35km (by my watch) on a gruelling section of the North Rim ascent, I had started bonking. “Bonking” or “hitting the wall”, is when glycogen, the body’s easy-burning energy (stored in your muscles and liver), is depleted. The key for ultra-running is keeping those stores topped up by consuming 200 to 400 calories an hour during the run. Working against me is that around 4 to 6 hours into endurance exercise, your body figures it’s going to be a long day out, and starts shutting down non-essential systems to save energy. Systems like digestion. So goodbye appetite, if you ever had the desire to eat yet another gel to begin with. Without the easy to burn glycogen stores, the bottom drops out of your world like a depression. Your legs really don’t want to push further. You don’t want to push further. I’ve dubbed this, “that little dark period between kilometers 35 and 40”. The place to have this is never; and definitely not on the 4.7mile/3,000ft climb between Manzanita and Supai Tunnel. Preface that “climb” with adjectives like “gruelling, Sisyphean, occasionally near vertical, technical, crushing, and a wee bit stupid”. Such is the nature of “epic” undertakings, and let no one tell you otherwise, the Grand Canyon is epic. Despite the deep caloric hole, the spectacle of the North Kaibab Trail kept ripping me out of wretchedness. Across this box of switchbacks ascending to the rim, a waterfall jets from sheer red rock columns. In the distance there is the rolling rumble and boom of rock fall. Everywhere you try to look there is enormity, on a level that ushers on vertigo and a struggle for comprehension. The Grand Canyon is enough to give America a national inferiority complex, all the guns and lifted trucks in the country are puny compensations. A bridge crossing and a few switchbacks up the wall ahead, I’d spotted another runner descending. I’m irrationally elated. Largely this has been a lonely undertaking. I filled up on water in Manzanita, but between the afternoon’s heat, the climb, and the altitude I’ve sucked back water roughly double my sea level pace. “That is fantastic.” I was buoyed by the generosity, the hydration, and meeting someone who’s been in the “little dark place” earlier in her run. Still, logically, even with the donated hydration, if the water tap at the North Rim Trail Head hadn’t been on, I’d have been forced to turn back. Having started later than most, 6AM, I’d ascended the North Rim in what for me is afternoon heat, but for spring here is just a warm day with a cool breeze. Charitably my physiology is “heavy sweating”. At 190-195lbs, I am a costly organism to run in terms of hydration and nutrition. Without the trailhead tap, I likely would have been forced to down-run back to Manzanita despite carrying 3L. However, between the water electrolyte mix and hitting my nutrition (which I should have been conserving) fairly hard, I slowly literally and figuratively climbed out of the bonk “pit of ultimate despair” to “summit” the North Rim trailhead. The view from just below the North Rim. Which leaves me in my current predicament; somewhere between 38.25 (researched), and 44.54 (measured) kilometers to run back to the South Rim, and with nowhere near the calories to keep my glycogen topped up for the whole way. That, more or less, leaves burning fat… Glycogen is the quick and easy fuel for your body to burn, fat, is a slow burner. At rest and during exercise performed at or below 65 percent of aerobic capacity, fat contributes 50 percent or more of the fuel that muscles need. Slower and that percentage can increase. Meaning, I’ll need to push through the “bonk” if it hits again, and I’ll be running at an even slower pace than usual. With nutrition, I’d estimate that the return trip in the 9 hour range. Now, it’s going to be a late night, but it’s been a fantastic day. Rush hour below the South Rim. 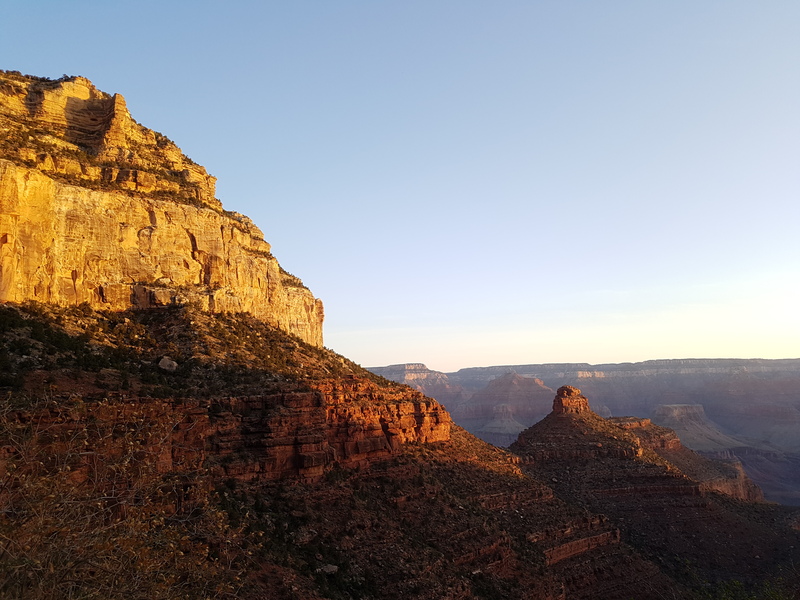 Starting this morning at 6:00 AM I began descending the Bright Angel Trail, given the runners I’ve met descending from the North Rim so far that departure was about 2 hours later than most. But that let me watch the grey and purple of pre-dawn creep down the canyon walls in a transition to the reds, ochers, and tans of daylight. Just after the 3-Mile Rest House, there had been a traffic jam of sorts. Two hikers from below, and I from above, had sandwiched three deer, who stood their ground. Eventually, all the humans took a few steps back and the deer bounded down the embankments between switchbacks. Oh, to be that sprightly. 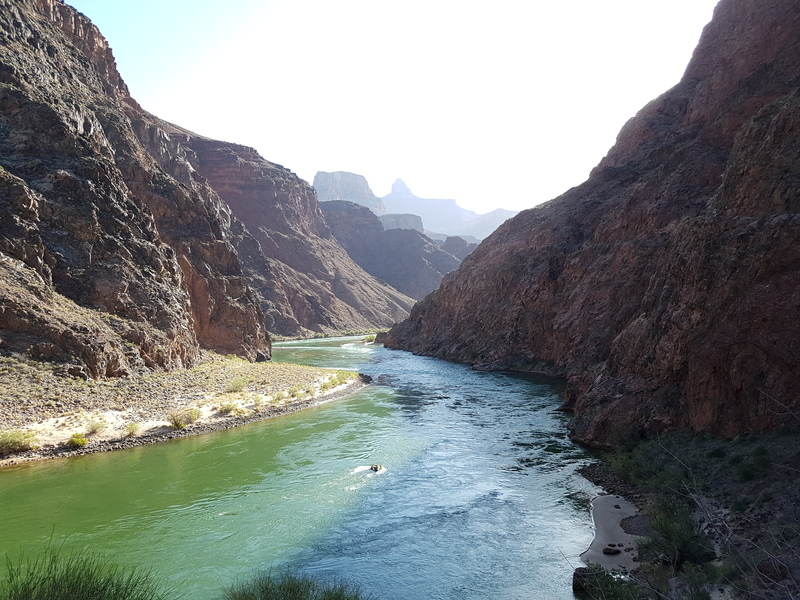 The Colorado River, before crossing to Phantom Ranch. A view of the Silver Bridge. 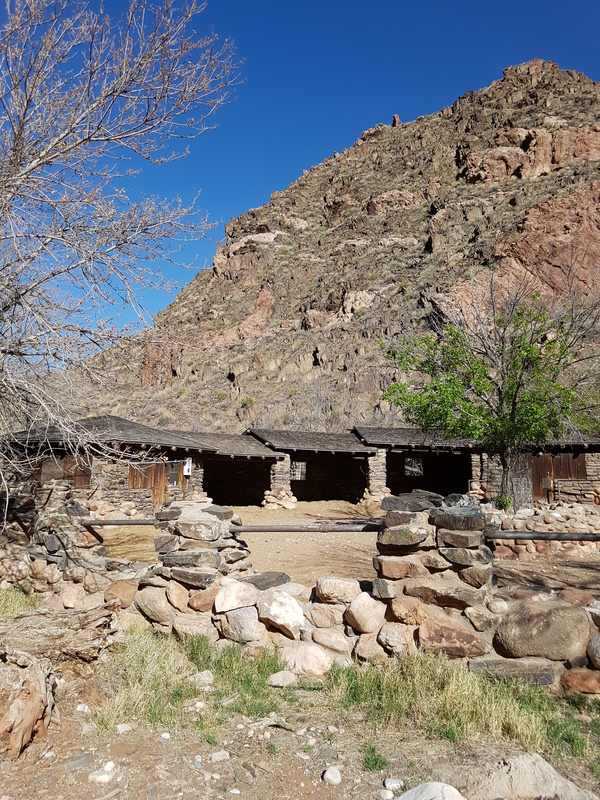 I’d reached Phantom ranch by 9:09 AM. At around three hours for the 15.9km (9.9 miles) and 1317m of descent from the Bright Angel Trailhead to the Ranch, it was obvious that attempting to self-document the run with video wasn’t going to be in the cards. Videography required running, setting up the camera, hitting record, running back then running by the camera, coming back and picking it up, and packing it away again. The process eats too much time and adds distance. From Phantom Ranch the ascent begins, gradually at first, then accelerates in what feels like an exponentially brutal curve of elevation. The climb to the North Rim is one of the most scenic and sadistic stairmasters in the world. And the entire run? 3,328m (10,919 ft) of elevation gain both directions, so 6,656m in total… or 21,837.27 ft, because imperial sounds better and size counts in the Grand Canyon. In terms of hydration, the situation in the Canyon for my spring run is better than advertised. Indian Garden campground, Phantom Ranch, Manzanita and the North Rim Trail Rim all had water, so other than the push between Manzanita and the North Rim there was only a little begging and no stealing… of water anyways. The current Parks’ website stated that neither the North Rim or Manzanita had water, so survival bonus. Had Manzanita not had water, I’d have filled from the stream there, and then made the tough call on whether the North Rim could be reached or not without additional hydration. The descent from the North Rim in the lengthening shadows of the late afternoon is spectacular. Sunrise in reverse; the light flows up red rock columns a special effect 6 million or 70 million years in the making – depending on which evidence you find more convincing. While I want to descend light and quick, I’m cognizant that a misstep at best leads to a very long wait on the trail. I pass one hiker, and knowing that someone is trailing behind me should anything go wrong, I open up my downhill pace a bit. Half way down to Manzanita, I come up on two hikers from Colorado. It’s a narrow section of trail, we get to chatting, and they ask how I’m doing. Ascending toward the North Rim begins gradually. Now I’m running on a quarter of a sandwich bag of trail mix, in addition to the half bag gummies I’ve been rationing. We’re close to Manzanita, and while I’m treating the refill of my water supply there, the two hikers catch me again – which is indicative of the length of my 30 minute plus rest/water treatment breaks. They’ve got a spare pepperoni stick and a couple of Nuun tablets. I joke with them about how quickly I’ve made the transition from prepared guy to “dirtbag” ultrarunner begging food. 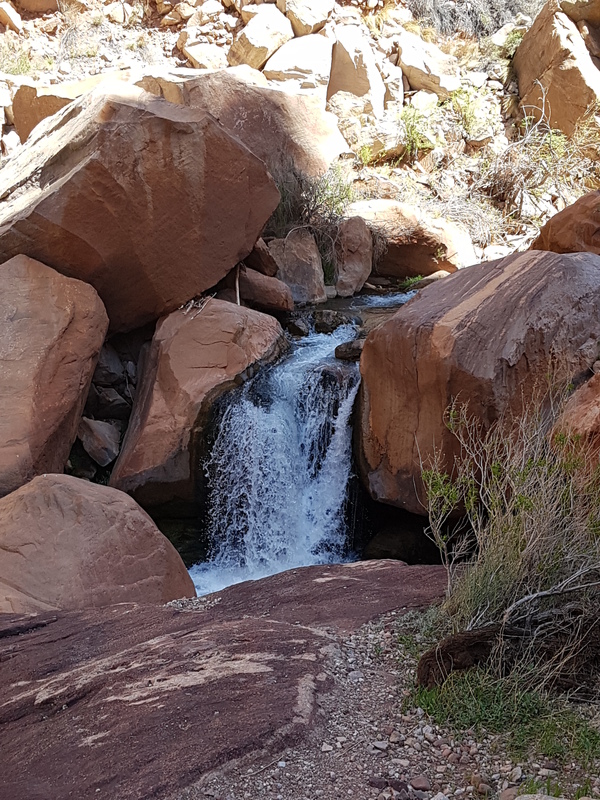 At 13.5 kilometers (8.4 miles) from the North Kaibab Trailhead I take a “slight detour” towards Ribbon Falls to avoid an elevation gain and drop on the main trail. By recall of the signs on my outbound run, I reckon this detour is a little loop on the far side of the creek paralleling the main trail, which then cuts back over. The detour starts as advertised, there’s a bridge and some narrower and more technical trail, but it’s running game on. I’m well into my third wind even, fueled by a carefully rationed pepperoni stick, and small nibbles of trail mix. Then the bypass starts creeping towards “adventurous”. 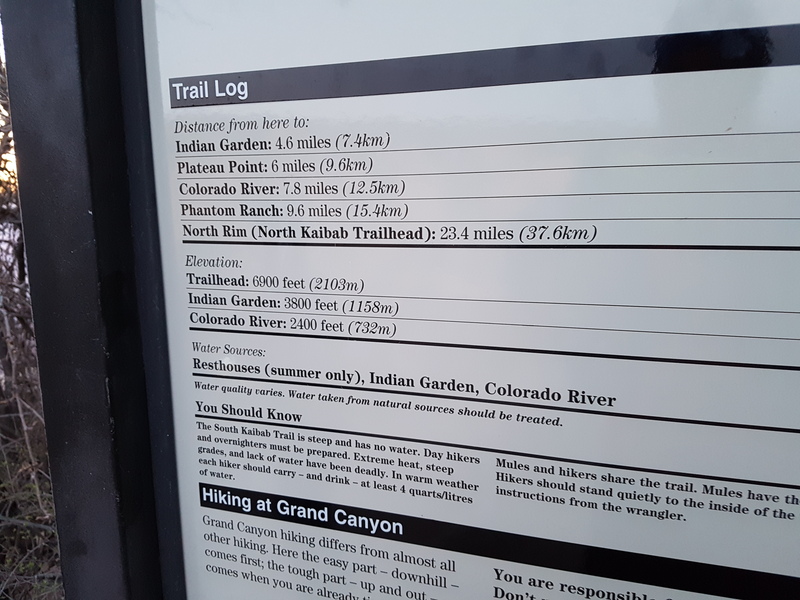 I lose the trail a couple times, then I realize that the connector back to the main North Kaibab trail to Phantom Ranch is going to involve a fairly major springtime water crossing. Now I’m searching for the trail to cross back, and eventually find one that is mostly stepping stones to cross the creek… mostly. The detour and searching eats time and adds miles, but has saved my legs fairly major ascent, and conserving them for the major climb ahead is a fair trade. I continue the riverside trail descent as the light purples and darkens. By the time I’m approaching Phantom Ranch, darkness has fallen. Bats flit in and out of my headlamp beam, darting for the moths drawn to a 300 lumen false sun. It is an aerial dance semaphored with the freneticism of a mammal fighting gravity in the awkward flight of convergent evolution. At the ranch I fill my water. I ask if they’d open the dining hall to sell me a coke or some chips; the self-appointed spokesman says they won’t. I’m bleary and unsure if he is even officially an employee. With at least 16 kilometers (10 miles) to go, I am feeling hollow. I contemplate begging food, but honestly I’m feeling a little embarrassed by the crowd forming around me at the water pump. I also consider calling it a night, but I have limited options. I could bed down under or on a picnic table at Bright Angel Campground in my emergency bivy sack. That would leave me cold, stiff, and still hungry in the morning. Though, likely, I could “dirtbag” some food from other campers. This plan would let me rest, but the fact is I’m moving well still. Not fast, but consistently. If I stop now I throw that away and face whatever stiffness sets in overnight. Pride also plays a role in the decision. Is there honor in running Rim to Rim to Rim with an overnight break in the middle? Overnighting is tempting but, to paraphrase a Klingon from the 90s, “Perhaps, tonight is a good night to run.” I am rewarded immediately by the canyon at night. A kit fox, sliver-grey with a silken black tail and dainty feline grace, swifts elegantly across my path. It melts into the vegetation of the valley floor before I can snap a picture, as fleeting as a dream’s memory. The antithesis of this refined motion, I ultra-shuffle onwards. Leading up to this run, every time I spoke about “trying to run rim to rim to rim”, I knew in my heart there was no “try”. Past Manzanita’s outbound point of no return, there is only “do”, bare pressing the SOS button on your inReach sending out a satellite distress call for help. That is not something you do because you’re shy a energy goos. Now, messaging your partner, who is waiting on the South Rim at the Bright Angel Lodge, and “volun-telling” them to hike down the trail to pace you on the way back up is entirely acceptable. Kevin agrees to meet me at the 3 Mile Rest House – 8 kilometers ahead. In addition to pacing me, he’s accepted an order for additional calories. 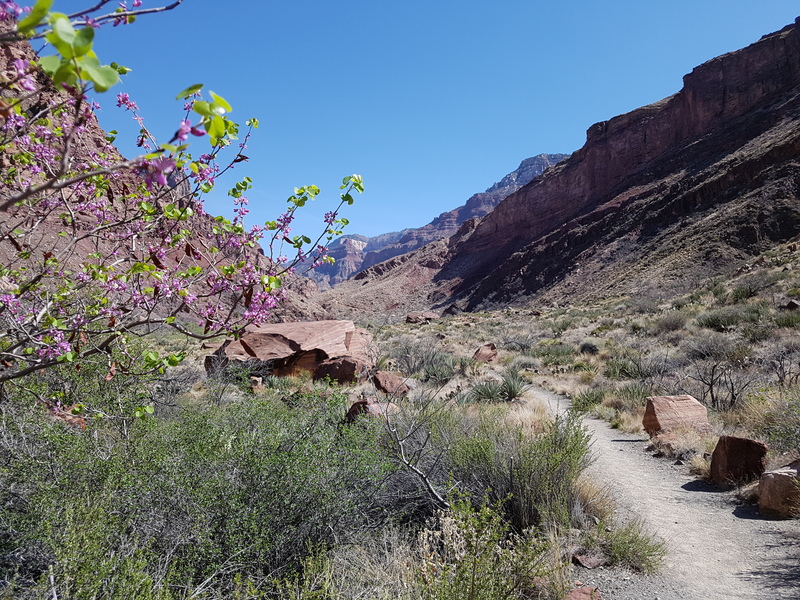 “Eight kilometers,” I tell myself, “I can do eight kilometers any day of the week.” Except it’s really ten kilometers, and a sizable portion of the climb up the South Rim on Bright Angel Trail. Crossing the Colorado River at night is a joy; you are a capsule of light looking down at the inky green through a grid metal bridge. The sand along the trail beyond the silver bridge is even more of joy. The soft sink of the sand, a thief of energy on the outbound run, is a delightful cushion on feet that have been in use for around 14 hours. In the dark, I am deep in the meditation of motion, time is meaningless – a null – a passenger in my own body, cocooned in wilderness and dark, I’ve hit a “go forever” state. Indian Garden, so much easier to navigate in the light. By River Rest House, I’ve completely consumed the remaining three gummies, and the one errant stroopwaffle that had escaped my notice. The canyon floor is still warm enough that I’m sweating, so it’s good that the dryness of each tiny bite of the stroopwaffle is forcing me to drink. Then I become preoccupied with drinking; do I have enough fluids to make it up and out? Rationally I should, but as a precaution I decide to fill up at the Indian Garden Campground. Then I argue with myself about carrying the extra weight. Looking ahead, I can mark the South Rim’s topmost border by the cut of blackness across the stars. Then there is a surprise; two headlights are slowly bobbing and climbing. In the dark I have no way of telling how far away there truly are, but I’m lifted by knowing I’m not entirely alone out here. Somewhere ahead, two people are between rock and black drop ascending a series of switchbacks. One light beams directly at me for an instance. Are they thinking the same thing? Approaching Indian Campground, the headlights become a disappeared mystery, and I’m consumed by navigation. There are a series of minor creek crossings where I lose the trail on the far side in the dark. I cross one creek three times, literally coming face to face with the canyon wall before crossing back. I end up referencing the track on my inReach to find the course, my Fenix 3 lost power at around 65 kilometers so is valueless in the matter. While the dark has added a new component to the crossings, the creeks also seem higher than when I headed out. The pedantic crossing dance is undertaken with graceless caution. Finding the Indian Garden Campground water tap is even trickier. In my mind it is ahead in a small grove on my right. I keep peering into the night for it on the little side trails, occasionally skirting down them and back, but it’s not there. The water is just a precaution in case something happens and I have to spend the night out. I can always filter the stream water if needed, except the pack mules that carry passengers and supplies from the Rim to Phantom Ranch come through here. The smell of fresh mule droppings and urine denote a risk best unaccepted even with my water filter. At the north end of Indian Garden the tap is on my left, and I concede I’m feeling a bit confused. I may not need the water, but I want it for safety. I lose myself in the cumbersome process of filling and purifying my soft flasks, and topping up the bladder. A trick of my headlight’s reflected light makes it appear that another light is approaching around each switchback corner as I climb. Or, perhaps, that is an optimistic illusion. Occasionally, looking up the trail, I think I see a headlight slowly working its way down. Is that Kevin with calories, a break in the rim wall letting a star fool me, or an outright hallucination. I stop contemplating these options and force focus on the climb, the switchbacks, the rocks and steps. With the low-contrast of the LED light and tan colored trail, concentration is key. Mistakes due to a lack of focus, potentially tragic. Bright Angel Trailhead is about 930 meters (3051 feet) above me, working my way up is the only thing that matters. As I approach the Three Mile Resthouse toilets, I feel a little heartbreak. The Resthouse is just ahead, there is no Kevin, no headlamp. A little crushed, I keep plodding upwards. And then, the light coming around a switchback is not a trick. It is companionship, and calories – there is a strange equal pounce on the backpack of food, and the support of a partner. I sit down for a bit. I gag the maltodextrin-mess down regardless, followed by a blast of electrolyte. Then I have another as we’re walking. What doesn’t make me gag is the salt and vinegar Pringles. 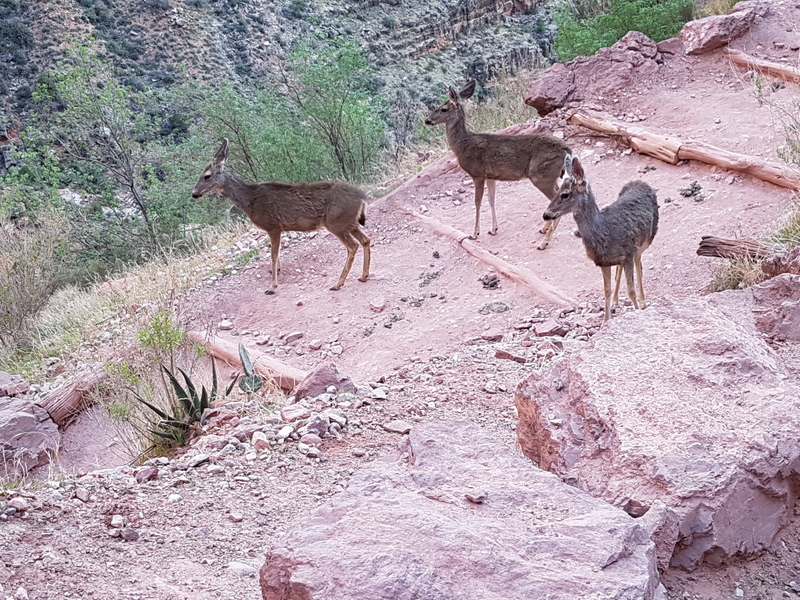 As we walk up the switchbacks of the Grand Canyon’s South Rim, we chat, take breaks, sip fluids, and I very slowly nibble away at what amounts to a handful of chips. The calories are helping, but more so the companionship. Then, through fortitude, kindness, assistance, and some forced smiling it is done. The sign at the Bright Angel trailhead looms in the reflected glow of the headlamps, with its strong warnings of doom to all those who attempt to hike to the canyon floor and back in a day. At 1AM it’s a low key completion, the magnitude of the run will taking days to set in. Rim to Rim to Rim not only survived, but nearly nothing went wrong. It is a sweet topper to a 19 hour adventure across the Grand Canyon and back, to finish the ascent together.